Mustang’s Centennial Elementary named Lauren Sanders, the school’s media specialist, as the 2017-2018 Teacher of the Year. This is Sanders’ 13th year to teach, all of them have been in Mustang. Sanders remembers no epiphany, no declarative moment when she knew teaching would be her career. She spent her teen years as a babysitter. She worked in the church nursery. She worked in Bible school. Her intention to become a teacher was always there; it had never been a decision. “I didn’t give it much thought,” she said. When she graduated from high school, Sanders got married to her high school sweetheart and attended college at the University of Oklahoma. Her student teaching was in a first-grade classroom at Mustang Elementary. 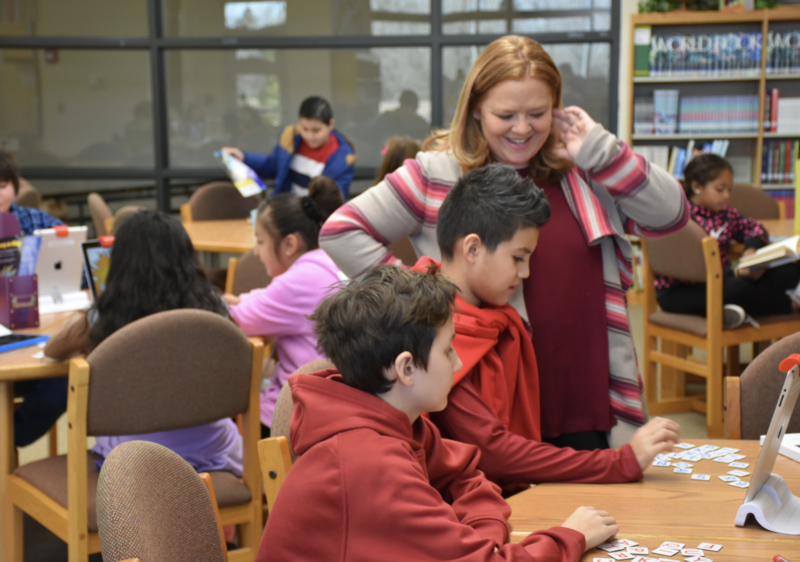 She’s been with Mustang for 13 years, spending time in second through fifth grade classrooms at Mustang Elementary, Mustang Valley Elementary and now as the media specialist at Centennial Elementary. The new role is fitting. When she was around 6-years-old, Sanders turned part of her walk-in closet into a library. Her friends and younger sister had hand-made library cards. When Centennial’s media specialist position came open, Sanders had a master’s in administration from Southwestern Oklahoma State University, but she didn’t have a degree in library science. “We were sitting around talking and I thought, ‘Why can’t I do that?’” Sanders said. Principal Molly Wilson hired her for the position and Sanders enrolled in school. She’s adding another 24 hours to her master’s degree to earn a library science master’s of education. She’s set to graduate in March. Sanders is thrilled with the change. Sanders has no resemblance to stern librarian stereotypes. The media center is part of the weekly “specials” rotation that includes art, music and PE for first and fourth grades, which means Sanders teaches two 50 minute lessons a day. For other grades, she does a mini lesson, introducing a genre or an author and then students are free to check out books. She also has the opportunity to set up special projects school wide. She coordinated the school’s “Grandparents’ Day” and a book drive for Denham Springs, Louisiana schools which were devastated by flooding. Sanders collected approximately 1,000 books for the Summer Reading Program so it wasn’t a problem if a book didn’t make it back into circulation. “That was the point. I wanted them to read over the summer and I wanted it to be okay,” she said. Sanders is also focused on teachers. She’s working on technology stations to show teachers during professional development days how to integrate technology into their classroom in a meaningful way. Sanders is one of 14 site Teachers of the Year for Mustang Public Schools. The District Teacher of the Year will be announced at a special banquet at the end of March.